Another week, another readathon, and this week I’m signing up for #TheReadingQuest. I came home from work today to find my housemate Emma constructing a TBR list with a game board and thought ‘I need to do this’, so here I am, way past the time I was planning to go to bed, writing a post. I say writing, much of this post is copied and posted from the original due to the rules, and complexity of the readathon. Now, that shouldn’t put you off folks, it’s my stupidity that needs the rules and regulations written somewhere I can easily find them. 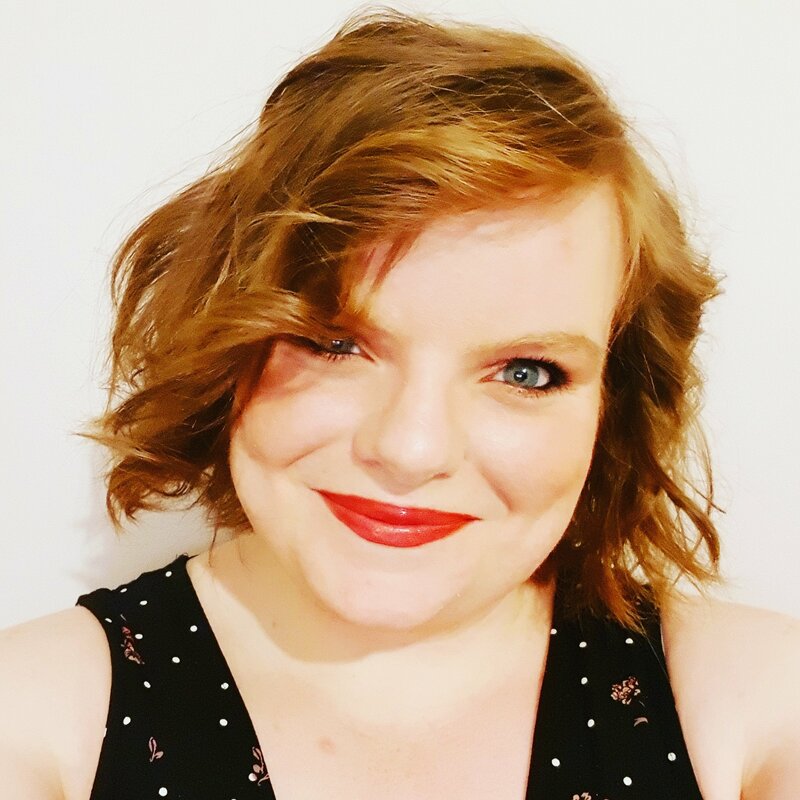 This awesome readathon is courtesy of Aentee at Read At Midnight, so if you want more information, or to sign up and take part, please click on her blog name and be transported! The quest is set to take place between Sunday 13th August to Sunday 10th September, 2017. The basic mechanics of the reading challenge is simple: it’s based on a bingo board (termed The Quest Board for our purposes), each square on the board represents a stage (or reading prompt) you must complete. The board will take you on a journey through your TBR, and rewards you with experience points and health points, just like a video game. Let me copy the characters, rules and bingo board, before setting out my TBR. Once you pick a character, you must stay on their path (or the side quests) before you can proceed to another character. E.g. If I am a Knight, I cannot do the Bard’s ‘Fairy Tale Retelling’ prompt until I’ve completed all 5 of the stages for the Knight. If you do complete your first chosen character’s quest before the quest period is over, you can follow a new character path for additional points. Along with the separate Character Class quest levels (Purple Squares), the centre of the Quest Board is a conglomeration of Side Quests (Blue Squares)! Complete these challenges to earn extra points and bonus experience for your character. You only need to read one book for each of the four corner stages on the quest board (e.g. I can read Want by Cindy Pon for the ‘Book With One Word Title’ prompt and it will count towards both the Mage and the Rogue path). 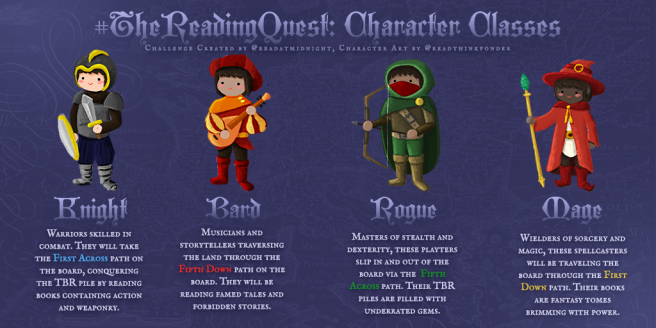 All characters will start off with 10 Experience Points (EXP), and each book (in any format: physical, eBook, or audiobook) they complete for the Quest Board will add another +10 EXP. The exception are graphic novels/manga, which will give +5 EXP. The exception is for books written by marginalised authors. These books will earn your characters bonus EXP. For each book completed for the Quest, you will gain +20 EXP. Adventurers who complete their character’s quest before the challenge period will earn a +50 EXP. You will earn an additional +30 EXP for any additional character quest you complete after that. Because I am not interested in employing polynomials or convoluted equations for a reading challenge, I’m going to go ahead and say your character will level up with every +50 EXP. They all start at Level 1. All characters begin with 10 Health Points (HP). Every 10 pages you read during the Quest will give you +1HP. The exception are graphic novels/manga, which will give you +1HP every 20 pages. 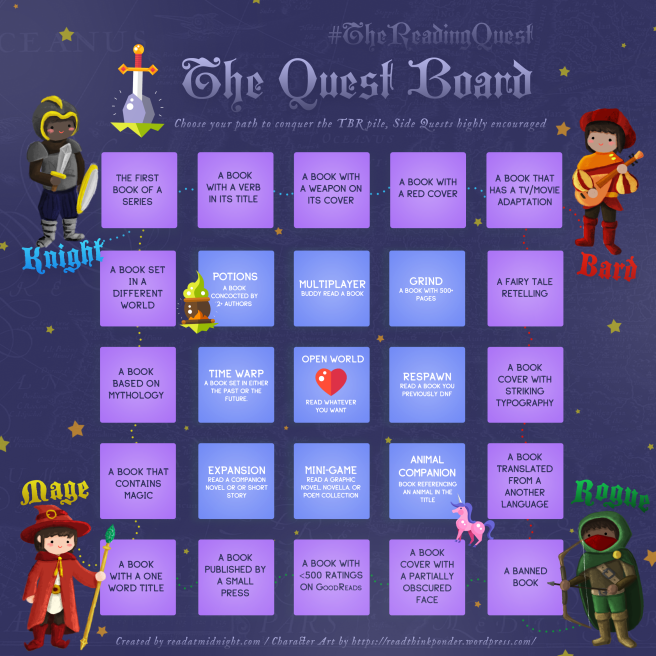 Photos of your #TheReadingQuest books or TBR pile will earn you 1HP each. This contributes towards the maximum of +20HP from Social Media interactions mentioned above. The Knight: These players are warriors skilled in direct combat. The stages within this path are inspired by action and weaponry. The Mage: As wielders of spells and witchcraft, these players will conjure and summon their way through tomes contain magic and whispers of alternate lands. The Rogue: These adventurers have absolute mastery over stealth and speed, and they celebrate underappreciated books and half-forgotten stories. The Bard: While the bards may not engage in direct combat, they make up for it with their intimate knowledge of songs and stories. They will be reading famed tales and singing lost songs. Re-spawn: Read a book you’ve previously DNF’d – Vilette Charlotte Bronté – I make a point of not DNF’ing books to the extent that this is the only book I am aware I have DNF’d. Now, I am actually already taking part in Tome Topple, and I am going to be taking part in Bout of Books later this month, so I have tried to think ahead and decide what I might want to read for those readathons, or what fits with Tome Topple and it’s rules now. I am also travelling to the USA with Emma, to Washington DC and New York, so I am also thinking about the books that I might want to take with me! 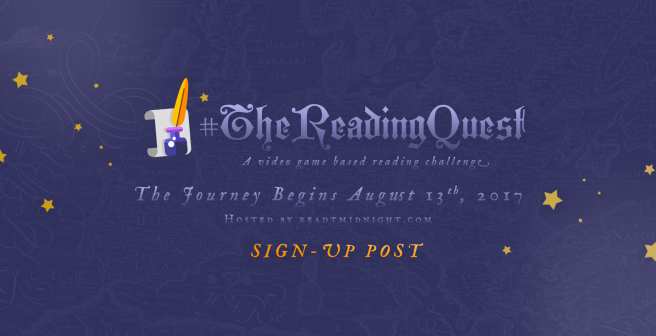 Are you taking part in #TheReadingQuest? What character are you thinking of starting with?